2018. MANY HANDS MAGAZINE. An Herbalist’s Guide to Winter Wellness. 2018. THE RECORDER, Look Who’s Cooking: Making dishes flavorful, bright with herbs. 2018. CANCER FIGHTING FOODS VIRTUAL SUMMIT. Herbs & More, Interview & Segment. 2018. BOSTON VOYAGER, TRAILBLAZERS SERIES, Conversations with the Inspiring Brittany Wood Nickerson. 2018. MEDITERRANEAN LIVING, Recipes from the Herbalist’s Kitchen Book Review. 2018. DAILY HAMPSHIRE GAZETTE, Potluck: Mint and Feta Bruschetta with Chive Blossoms. 2018. READABLE AWARD, Recipes from the Herbalist’s Kitchen nominated for a Readable Award – Socially Conscious category. 2018. NAUTILUS AWARD, Recipes from the Herbalist’s Kitchen is the winner of a silver Nautilus Award. 2018. FOREWARD REVIEWS, Recipes from the Herbalist’s Kitchen is named a Finalist for the 2017 INDIES award for Cooking. 2018. TAPROOT MAGAZINE, Instagram Takeover. 2017. PREVIEW MAGAZINE, The Herbalist’s Kitchen. 2017. MANY HANDS MAGAZINE, Herbs to Live By. 2017. NUTMEG ASPIRIN.COM, Lavender Fizz – Anti-Anxiety Tonic. 2017. MOTHER EARTH NEWS.COM, Hazelnut Cornmeal Cake w/ Rosemary Honey Recipe. 2017. MOTHER EARTH NEWS.COM, Stuffed Butternut Squash Recipe. 2017. SANDRA’S KITCHEN NOOK, Recipes from The Herbalists Kitchen Review. 2017. THE ESSENTIAL HERBAL MAGAZINE (Sept/Oct 2017), Recipes from the Herbalist’s Kitchen Excerpt. 2017. SAN DIEGO UNION-TRIBUNE, Recipes from the Herbalist’s Kitchen Excerpt. 2017. IHEART RADIO, “Fearless Fabulous You!”, Interview. 2017. THE HERBAL ACADEMY, Recipes from the Herbalists Kitchen Book Review. 2017. 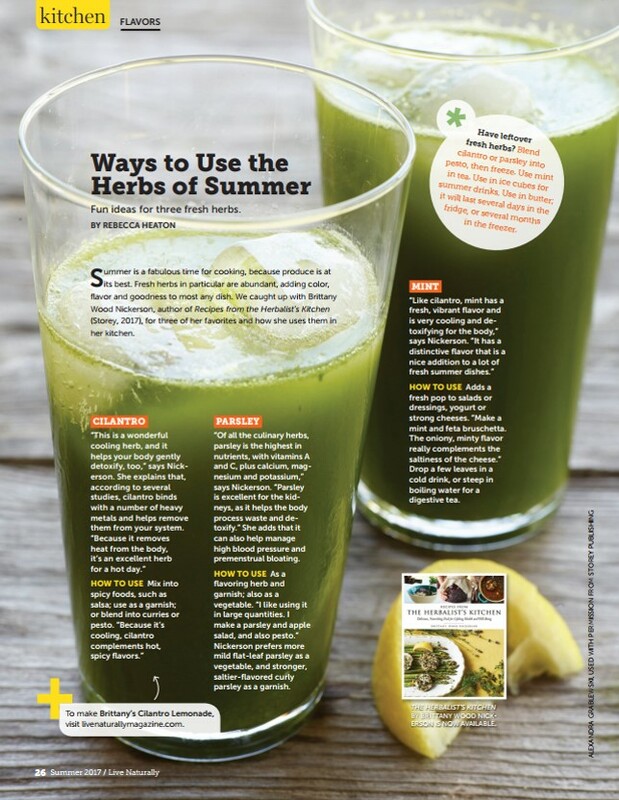 CLEAN EATING MAGAZINE, Recipes from the Herbalists Kitchen Review. 2017. EDIBLE EAST BAY, Recipes from the Herbalists Kitchen Review. 2017. IMAGE MAGAZINE, Recipes from the Herbalists Kitchen Excerpt. 2017. THE BOSTON GLOBE, Q & A with Brittany – Cooking with Herbs. 2017. VALLEY ADVOCATE, Recipes from the Herbalists Kitchen Review. 2017. DAILY HAMPSHIRE GAZETTE, Feature Interview and Article. 2017. THE NOURISHED KITCHEN, Recipes from the Herbalists Kitchen Excerpt and Recipe. 2017. SHELF AWARENESS (TRADE), Recipes from the Herbalists Kitchen Review. 2017. TONIA’S KITCHEN, Radio Interview. 2017. MOTHER EARTH NEWS, Instagram Takeover. 2017. AROMA CULTURE MAGAZINE, Author Article and Recipes from the Herbalists Kitchen Excerpt. 2017. LIVE NATURALLY, Author Interview & Recipes from the Herbalists Kitchen Excerpt. 2017. CLOSER WEEKLY, Recipes from the Herbalists Kitchen Review. 2017. VALLEY ADVOCATE, Recipes from the Herbalists Kitchen Excerpt. 2017. MODERN FARMER MAGAZINE, Recipes from the Herbalists Kitchen Review. 2017. TASTE FOR LIFE MAGAZINE, Recipes from the Herbalists Kitchen Review. 2017. PUBLISHERS WEEKLY, Recipes from the Herbalists Kitchen Review. 2016. MOTHER EARTH NEWS – Herbalist and Artist Create Everyday Guides for Healthy Living. 2015. DAILY COLLEGIAN – Local Artist Chelsea Granger – Creation and Performance. 2015. HERBSTALK BLOG – Meet the Herbalist. 2015. MANY HANDS MAGAZINE –Power of Her Plants. 2014. SPRINGFIELD REPUBLICAN – Herbalist, Illustrator Produce Moon Calendar. 2013. THE REPUBLICAN –Balm to Ease Soreness. 2013. MASS LIVE – Voices of The Valley.